As a regular cosplayer, I think being able to dress up as a character is perhaps my favorite part of Halloween. 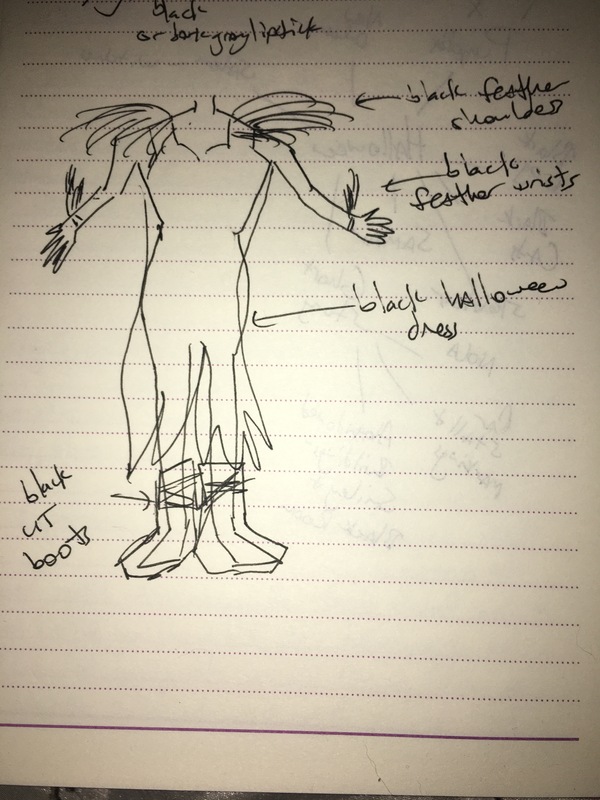 When I was younger (before I even knew what the cosplay scene was all about), I would agonize over what I wear come October 31st. Often I would want to do a cool costume, but was was too self-conscious to be able to go all out. I felt like there was an unspoken mold that I needed to squeeze into. Now that I’ve been attending anime conventions for a few years, have the make-up and special effects tutorials of Youtube to rely upon for expertise, and a lot more self confidence under my belt, I can finally try out those over-the-top looks I always wanted to as a kid. 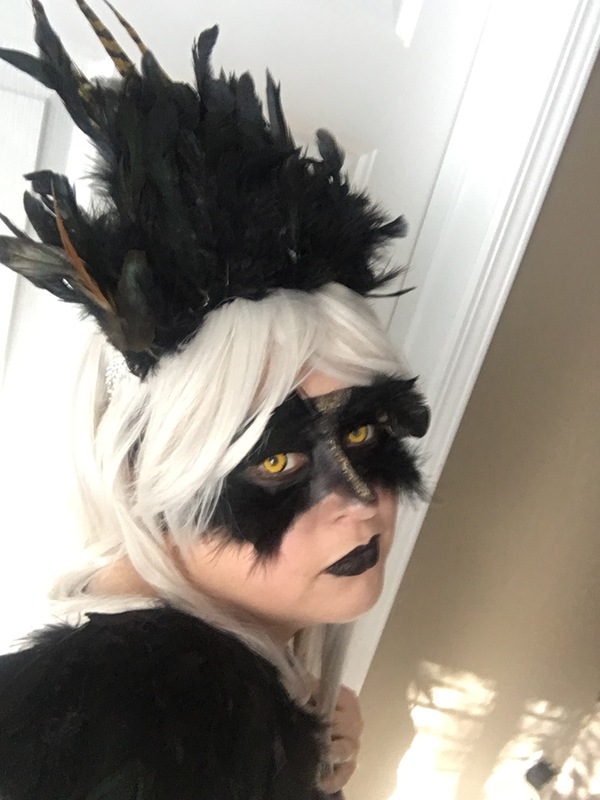 The other day I tried out what I thought of as my “black-feathered queen” look. I’m pretty pleased with the results! This look was inspired by the Instagram group @elysian.fantasy.artistry who does just incredible fantasy photography shoots. I’ve been following their work for a few months now, and they never disappoint. I had the idea for how it would look early one morning before I headed in for work. I took a few minutes to (badly) jot out the details before heading out the door. At the time, I didn’t even think about a crown, but that was added onto the concept later. 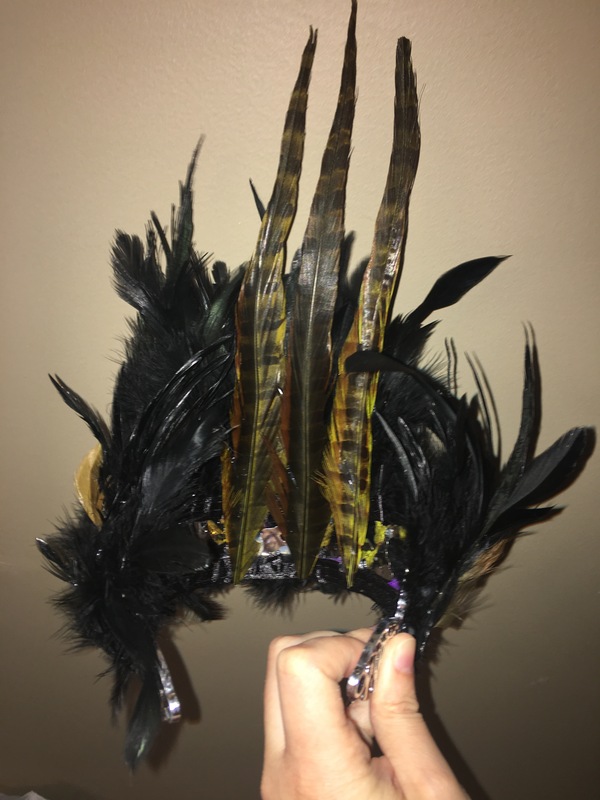 The black feather shoulder pieces I made for my female!Scarecrow cosplay for DragonCon this year. There’s a wonderful Youtube tutorial that walks you through how to make these with feathers, hot glue, and shoulder pads. 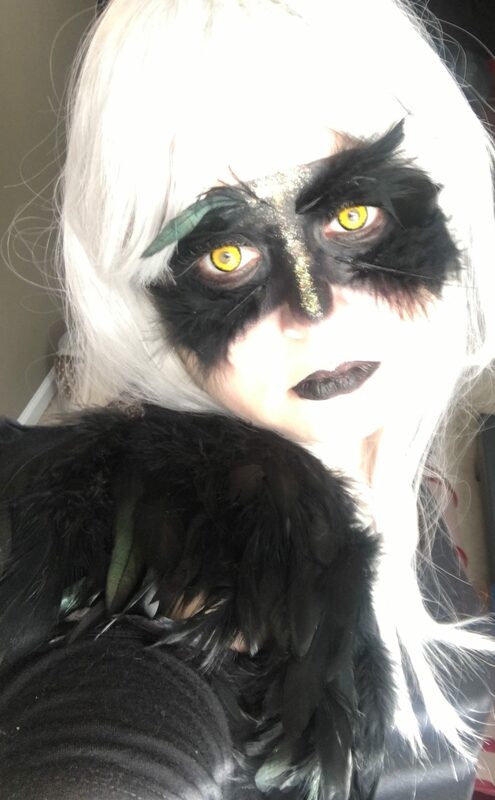 Basically I used the yellow contacts from that cosplay and the feathered shoulders, then added the black face paint and feathers to my face, with a dash of gold sheen and gold glitter. The headpiece was more of a struggle than I expected. 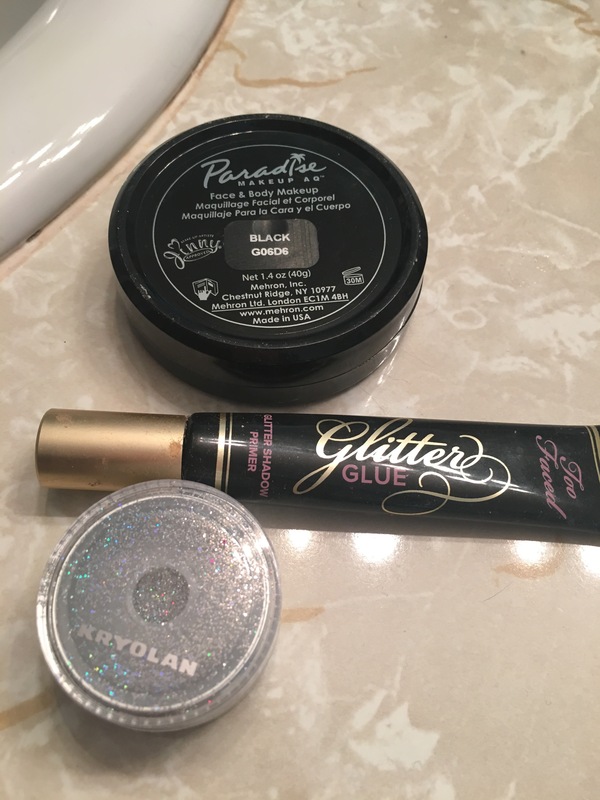 I took an old New Years plastic crown we bought for a few bucks at Party City last year and tore off the purple fur that was glued to the base. Then I hot glued black feathers all around it in layers, similar to how I did for the shoulder pads. 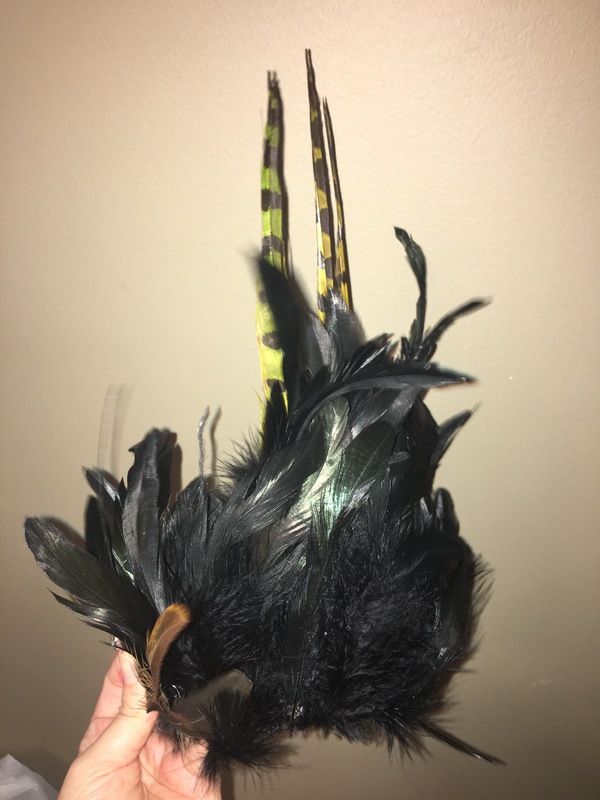 Once that was done, I found a few yellowish green feathers from an old Steampunk outfit I had and added them to it as well to give it some dimension and some height. Although I never intended for my love of cosplay to spill over onto my writing blog, I suppose it was only a matter of time. It’s a hobby that I’ve grown to truly love, so I’ll probably be posting more cosplay pictures and discussions here as I create/break/repair/attempt things, mixed in with my normal writing updates. 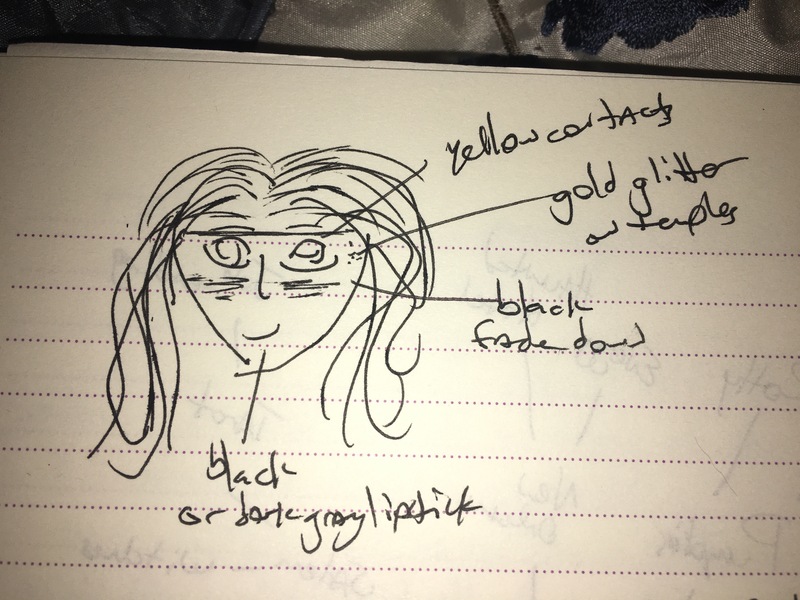 This blog has been straight writing for (at least!) five years now, so maybe it’s time for it to stretch its legs a little. 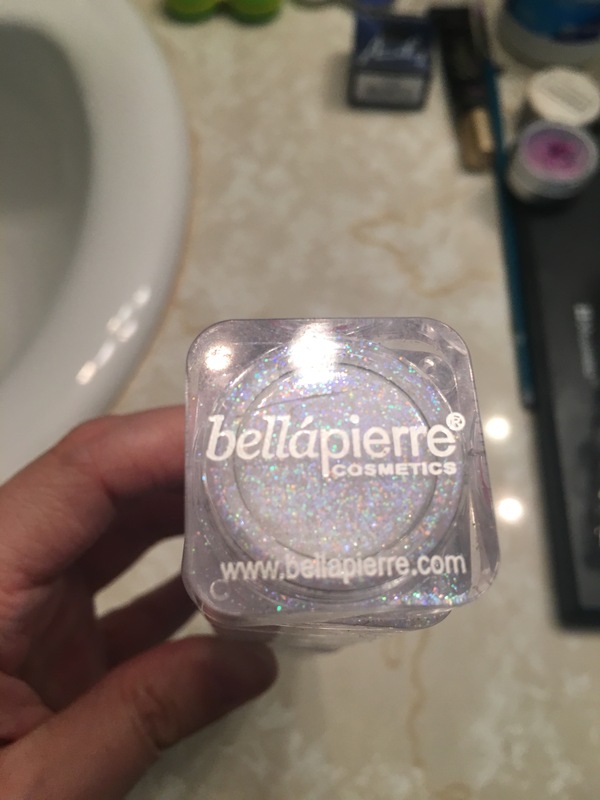 Do you have any cool makeup looks or costumes you’re hoping to try out for Halloween this year? I’d love to see what you’re putting together! I’m still reeling over how well Creepy Campfire did for days, but now it’s time to ramp up for the next horror story to crawl (scurry? creep? fly?) out of the woodwork. Pete Kahle, the awesome editor of this series, released this trippy, disturbing cover for Not Your Average Monster #2! Isn’t it great? The longer I look at it, the more creepy monsters I see in the background. It really reminds me of The Mist, one of my all-time favorite Stephen King stories, and that makes me so damn happy! Pre-orders should be up in the next couple of days, and I’ll be sure to post links so be sure to check back. In the meantime if you’re interested in getting your hands on a review copy, head over to the Bloodshot Books Facebook page and let him know. Some more from my Secrets of Leekston novel, my latest major WIP. Definitely will be ramping up the work on this as NaNoWriMo creeps ever closer. It’s a complicated novel with many paths and twists, but I’m really looking forward to it! Oh and if you’re participating in NaNo this year, add me! My username is: lenaf007. Setup: Work at the Memorial Hills Research Facility is just as shady as it sounds. It was nearly dawn when he came into work, having spent the last week at an extended stay hotel. His hours were too long, too sporadic for him to be able to stay home for long. Not without rising suspicion in his family and friends at least. It was a small price to pay for the reward he gained working at Memorial Hills. The place was a wreck on the outside, but once you took the old freight elevator down a hundred feet or so, the walls were no longer cold stone, but sleek metal instead. There was a slight jolt as the runners moved over from the rough tracks to the clean ones, both of which were inspected daily of course – nothing could be left to chance in a place that attempted so hard to look unkempt and unruly, to look like a place that not even the homeless would care to tread.